So much is happening bad, crazy and unbelievable that it is hard to keep track of. So let's take a quick run through some things we may have missed. 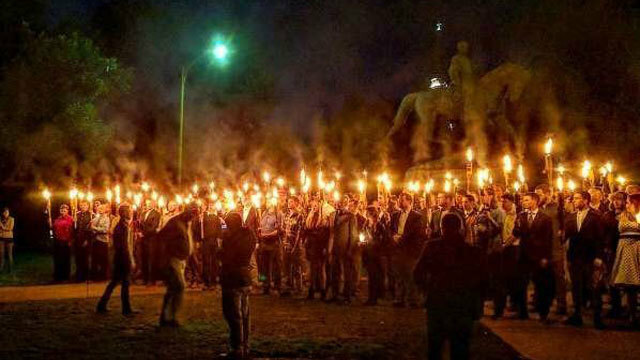 * Last week in Charlottesville, Virginia, the hometown of Thomas Jefferson had plans to remove a statue of the Confederate traitor general Robert E. Lee. White Nationalist Robert Spencer, led a protest of a bunch of white people with torches marching on downtown. Seriously, in 2017, a bunch of white people marched on downtown to try and keep a statue of a traitor to our country standing. “Usually things happen in the world, and you go to work and you’ve got your family and you’ve got your friends and you do what you do,” Popovich said. “But I feel like there’s a cloud or a pall over the whole country. In a paranoid, surreal sort of way, that’s got nothing to do with the Democrats losing the election — it’s got to do with the way one individual conducts himself. Todd Rundgren has a warning for supporters of President Donald Trump: Keep away. Rundgren’s latest album features the anti-Trump song “Tin Foil Hat,” which he recorded with Donald Fagen of Steely Dan. Variety’s Chris Willman said the new tune reminded him of seeing a couple walk out of a show last year after Rundgren criticized Trump from the stage. But the man behind hits such as “Hello It’s Me,” “I Saw The Light” and “Bang The Drum All Day,” said such a response doesn’t bother him. Rundgren laughed at the end of his comments, Willman noted. Re Spencer and the nationalists... They chanted "Russia is our friend" and "Blood and soil" which was the motto of the Ukrainian UPA (Ukrainian Partisan Army) which with the help of Riechs Komandante Erich Koch conducted a mass purge in 1943 murdering hundreds of thousand of ethnic Poles.